Samsung Galaxy S10 and Galaxy S10+ are two of the mobile phones expected to be unveiled when Samsung holds a Galaxy Unpacked 2019 event on February 20, 2019 in San Francisco, California, United States. On January 10, 2019, the South Korean tech giant took to Twitter to announce the event. The number 10 featured in the event invite refers to the expected announcement of the Galaxy S10 and S10+. The Galaxy S10 will be available for preorder from upon its unveiling at the Galaxy Unpacked 2019 event and will be released on March 8, 2019. Arriving in model numbers of SM-G970U, SM-G973U, and SM-G975U, the Galaxy S10 will have three versions a source told Gizmodo. Aside from the regular version, there will also be a Plus version and a flat version. These three versions include support for the 802.11ax WiFi or the WiFi 6. This new Wi-Fi standard offers better WiFi experience since it is easier on battery life and it offers faster speeds and more efficient network, according to Droid Life. The SM-973U will be the regular Galaxy S10 while the SM-G975U will be the Galaxy S10+. The SM-G970U is the Galaxy S10e, which will have only a dual camera and a flat screen. Before released the cellphones in the United States, Samsung has to obtain certification through the Federal Communications Commission. The device has complied with the necessary standards, according to the FCC test report. On November 13, 2018, Evan Blass took to Twitter to reveal that the Galaxy S10 will be ultrasonic. It will read the ridges of a finger in 3D using ultrasound waves, which is much more secure than the 2D picture gathered by an optical scanner by bouncing light off the finger. With a feature they’re calling Powershare, the Galaxy S10 will be able to wirelessly charge other devices. This is similar to that of the Huawei Mate 20 Pro. 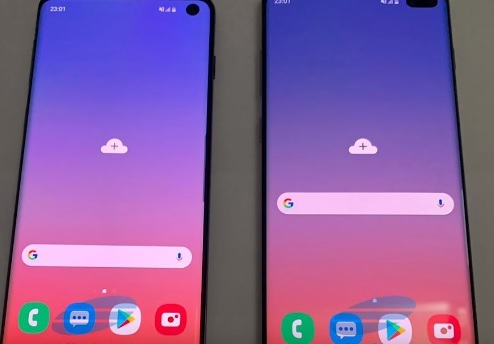 Called the Infinity O display, the hole-punch design featured in the Galaxy A8 will also be featured in the Galaxy S10. A hole in the front of the screen contains the selfie camera. The Galaxy Unpacked 2019 event will be livestreamed on the Samsung website. Following the event, the Mobile World Congress will take place in Barcelona, Catalonia, Spain from February 25-28, 2019.